Elvis Week 2018 Saturday, August 11 Party for “Where No One Stands Alone” Album Release featuring Lisa Marie Presley 1pm at Graceland Soundstage. It will cost you $30 plus $50 a total of $80 as you will have to buy the CD to get it autographed to celebrate a moment with Lisa Marie sings the emotional duet with her father. Hear Lisa Marie Presley Duet Below. Tickets for this event may be purchased individually through Graceland at 800-238-2000 or 901-332-3322 or at Graceland.com. Please note: The Lisa Marie photo /autograph for Elite Package holders and Premier Plus Package holders – only! Package purchasers will be grouped for photo opportunity with Lisa Marie Presley and she will autograph group photos. Premier Plus package holders must purchase “Where No One Stands Alone” three-piece Graceland Exclusive $50 Offer (CD, Vinyl & Cassette) for Lisa Marie to sign one of the items during autograph opportunity. Elite Package holders may also purchase three-piece Graceland Exclusive $50 Offer (CD, Vinyl & Cassette) and receive an additional autograph on one of the items during autograph session. Three-piece Graceland Exclusive $50 Offer can be purchased online in advance and picked up at Graceland during Elvis Week when you choose ‘Store Pick-up.’ Pick-up will be at the Graceland Soundstage ticket windows on August 10 and 11, from 10:00 am – 5:00 pm. Elvis Music. Fun for all. Light refreshments will be serves , all free of charge. Plus meet Sandy Milburn a friend and neighbor to Elvis Presley to hear her stories of when as a child she went swimming in Elvis pool. We will have tribute for Elvis Presley the man and his music with tribute artist performing. Guests to be announced. Let this be your meeting place instead of paying high prices at Graceland. There will be hot dogs drinks and other refreshments provided free of charge. Lisa Marie Presley in concert at the Gramercy Theatre in the Big Apple promoting her latest album Storm & Grace, although was forced to cut the set short due to vocal irritations. Following her rendition of Over Me, Presley explained that her throat was drying up, blaming it on age. She claimed: ‘Maybe its because Im getting old.’ Her record sales haven’t exactly been promising either, with her third album efforts reaching a miserly No 45 in the US chart. 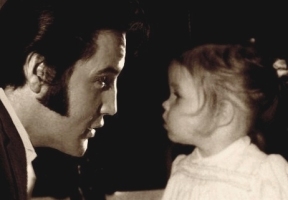 Watch the emotional duet featuring Lisa Marie Presley and Elvis singing ‘I Love You Because’. The audio ‘single’ is now available to purchase from iTunes and the video will be available soon. The video itself is a masterpiece that I must say brought tears to my eyes. You will see Lisa Marie in the Sun studio recording the song and home film of Elvis’ grandchildren, Lisa Marie and Priscilla. Lisa Marie performs a wonderful duet with her late father and does not ‘take over’ the song – with the first 1 minute 33 seconds with only Elvis’ vocals before Lisa joins in for the remaining 1 minute 22 seconds.